Did you ever wonder how are magnets made? Those cute little things we stick on our refrigerators to hold up shopping lists or photos or give as baby shower gift favors have a history all their own dating back more than 4,000 to the island of Crete and a legend concerning an elderly shepherd named Magnes. According to the legend, he was herding his sheep in an area known as Magnesia (not Milk of) when both the nails in his shoes and the metal tip of his staff suddenly became affixed to the rock on which he was standing. He dug up the earth and discovered the source, lodestones, which contain magnetite. The rock was either named after Magnesa or Magnes himself; no one can say for sure. For centuries magnetite was shrouded in mystery and was considered to possess magical powers. It was believed to have the ability to heal the sick, frighten away evil spirits and attract and dissolve ships made of iron! Many believed that there were entire islands with magnetic powers that could attract ships by the iron nails used in their construction. These islands were blamed for shipwrecks and disappearances at sea and it was once said the Archimedes sank enemy ships by using lodestones to remove their nails. For many years following the discovery of lodestone, magnetism was considered a natural phenomenon. The Chinese developed the mariner's compass some 4500 years ago, which was comprised of a splinter of lodestone carefully floating on the surface tension of water. In today�s world, many electronic devices rely on magnets to function as anything that has a motor uses a magnet. 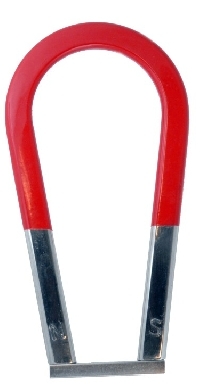 The attractive and repulsive nature of magnets is used extensively in medicine, computer chips, television, telecommunications and electronics. The question of how are magnets made is answered by the use of metal elements and alloys. Until recently, these materials produced all magnets of different strengths. Nickel, iron or cobalt are the basic materials. In understanding how are magnets made, it is important to remember that when these materials are exposed to a magnetic field, the structure of the material is altered on a microscopic level and rearranged in polarized lines. When enough of the metals are polarized, it becomes a magnet. What are some different types of magnets? Ceramic magnets contain iron oxide in a ceramic composite. These are the ubiquitous refrigerator magnets that we all know and sort of love. Also known as ferric magnets, they aren�t very strong. These magnets are made from aluminum, nickel and cobalt. Although stronger than ceramic magnets, they are not as powerful as the ones that incorporate a class of elements known as rare-earth metals. These magnets contain iron, boron and the rare-earth element, neodymium. These magnets are a combination of cobalt and the rare-earth element samarium. They are more unstable than other magnets, as some of these are flexible and moldable, others work only at extremely low temperatures, and still others pick up only very lightweight materials, like iron filings. The question of how are magnets made concerns a process involving magnetic fields and polarized lines that has changed little down through the years. Go out and make (or at least buy ) some magnets today !